I feel like my blogging game has been slacking since moving, but I guess that's what happens when you get busy (I love to blog, but it always seems like it is the first thing to get cut when I'm short on time!). In effort to get back on the blogging train, here's a quick peek of what we've been up to! Shortly after moving to Texas, Kelli and I made plans to get together for dinner! It was so great meeting her, and she is as sweet as they come - I feel so fortunate to already have a friend in the area! Cheers to blog friends turned real life friends! Part of getting settled in a new area is finding a new grocery store and learning the layout - I hate wandering!! I'm an in-and-out kind of grocery shopper, BUTTT I couldn't help but stop and admire the beautiful flowers that they were selling... can't go wrong with hydrangeas! 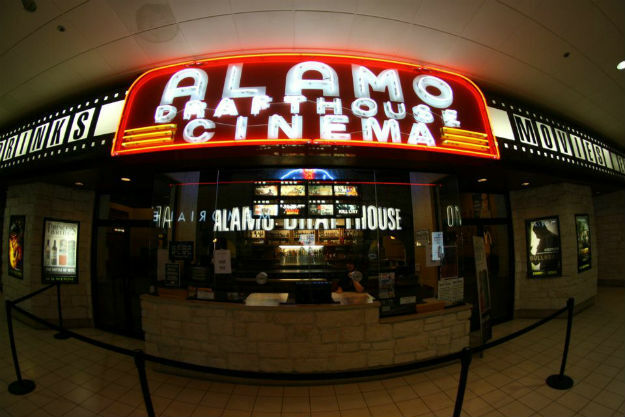 John and I have been so busy putting things together and unpacking, and we decided we needed a mini date night to Alamo Drafthouse which is a movie theater that serves dinner and drinks during your movie! We saw Bridge of Spies; John liked it, but I thought it dragged on a bit. It was quite fun, and while it may not be for everyone (since people are ordering food throughout the movie), we had a great time! The rain finally cleared up on Sunday, and John and I headed out for some delicious Mexican food at La Gloria... it was delicious and just what we needed! Also!! The best part about all of the rain was that it really cooled down the air temperature. I was able to (legitimately) wear a scarf and a vest - so there was no shame in my fall game! I love reading about your time is SA - La Gloria is my absolute favorite! Its like a walk down memory lane for me - haha :) Have you tried Central Market? Seriously the most amazing grocery store ever, and my husband and I frequently talk about how much we miss it. You need to try the fish tacos at The Cove. The place looks kinda weird, but they have the BEST fish tacos I have ever had, in my life! So glad you all are settling in! Which outlet malls did you hit up?? You have me craving tortillas from Mi Tierra now. (I'm not as crazy about their other sweets, but their homemade tortillas are SO GOOD!). Love that you and Kelli got together! So glad you guys are settling in-- and yay for meeting Kelli and her husband. I love that picture of John getting the pretzel, haha, it looks like you guys really were the only ones to brave the weather! Blogging is way less important than real life, so it's fine when it's the first to take a back seat. Looks like you had a fun weekend, despite the rain. Your scarf is pretty! Learning a new grocery store layout is one of my least favorite things ever. Or even just going to the smaller one I only go to when I need a quick trip but not knowing where everything is. When we moved to FL from CO I was so annoyed at grocery shopping ha. Thankfully you pick it up pretty fast! I hope the rain has calmed down for you a bit over there! But sounds like you're trucking through it. And now I'm craving a pretzel! It's amazing how annoying it is to learn a new grocery store! But, I wouldn't have been able to resist those flowers! Blog friends really are the best friends!! I am so happy to hear that you are getting settled in. I love the Alamo Draft Houses! I wish we had one in Maryland. I love the Alamo Draft House! They have one in Austin that we go to when we go visit Cory's brother. Hope y'all are getting settled in. Can't wait to see the house! So glad things are going well in TX! That dinner and a movie thing sounds amazing! I never heard of such thing!